You can configure one or more shipping rules that enable the shipping methods for the provided destinations and set the customized shipping service price by adding a surcharge per service option or globally for all options of the service provider. See a short demo on how to create shipping rules in OroCommerce, or keep reading the step-by-step guidance below. On the checkout, when a customer user provides the shipping address, the OroCommerce evaluates shipping rules one by one following the Shipping Rules Sort Order. The matching shipping rule may enable one or more shipping method(s) in the shipping options on the checkout and set the shipping service fee components that are used in shipping cost calculation. To decide whether the shipping rule fits the order or not, OroCommerce uses the shipping destination and the shipping rule condition defined with the expression. The condition may rely on the customer order context. When a shipping rule destination and condition matches the order details (e.g. customer, ordered products and the environment), the shipping rule enables its shipping options and shipping fee components. When the OroCommerce gets to the shipping rule with the enabled Stop Further Rule Processing flag, the remaining rules are not taken into account and their shipping methods are not shown as the shipping options on the checkout. This is helpful when you would like to enforce the recommended shipping method for any location or other conditions it is technically applicable (e.g. use local shipping vendor for all addresses they handle or use the specific shipping vendor that has a VIP SLA with the particular customer). It is recommended to put this type of rules to the top (e.g. setting their sort order to 1). When the shipping option is enabled by multiple shipping rules, only the first occurrence is shown to the customer user—the one from the shipping rule with the lower sort order value which means closer to the top of the list. When both shipping rules apply to the order, the customer user gets UPS Worldwide Expedited with +10$ surcharge. The shipping methods from the same service provider may be enabled in different shipping rules. UPS Worldwide Expedited with +10$ surcharge (enabled by shipping rule A). UPS Worldwide Express with +5$ surcharge (enabled by shipping rule A). UPS Next Day Air with +5$ surcharge (enabled by shipping rule B). Ensure that the integrations for the shipping methods that you plan to use (UPS, FedEx, Flat Rate, etc.) are already configured. For more information on shipping method integrations and how to configure them, see Shipping Method Integration. In the main menu, navigate to System > Shipping Rules. The list of shipping rules opens. Click Create Shipping Rule on the top right. The shipping rule create page opens. Select the Enabled check box to activate the shipping rule. You may keep it unselected while you are drafting and testing the conditions. Name—Specify the shipping rule name. Sort Order—Specify the sort order to set the priority compared to other shipping rules. It is used to select which shipping method to apply when more than one satisfy the defined conditions. See Overlapping Shipping Methods Definition. Currency—Select the shipping cost currency from the list. Please note that the list of available shipping methods will depend upon which currency is selected here. Select the Stop Further Rule Processing check box to prevent applying other shipping rules with lower priority. See Stop Further Rule Processing Mode. Provide the destination to apply the shipping rule for. Depending on the granularity that you require, you may provide just a country, a country and a state, or a country and a distinct list of postal codes. Country—Select a country from the list. State—Select the state from the list. The list of states appears after you have selected a country. Enter the list of postal codes. If required, in the Conditions section, specify the expression that describes the conditions when this shipping rule should be applied. In the Shipping Method Configurations section, add the shipping methods that should be available at the checkout when this shipping rule applies. To add a single shipping method, select it from the list and click + Add. To add all available shipping methods, click Add All. Only one shipping method per integration may be selected in the shipping rule. For example, to enable several flat rate options with various delivery SLA and insurance, please create a separate shipping rule for every option. A shipping method appears in the list only if it is configured to support the selected currency. To delete a shipping method, click the Delete icon at the end of the corresponding row. 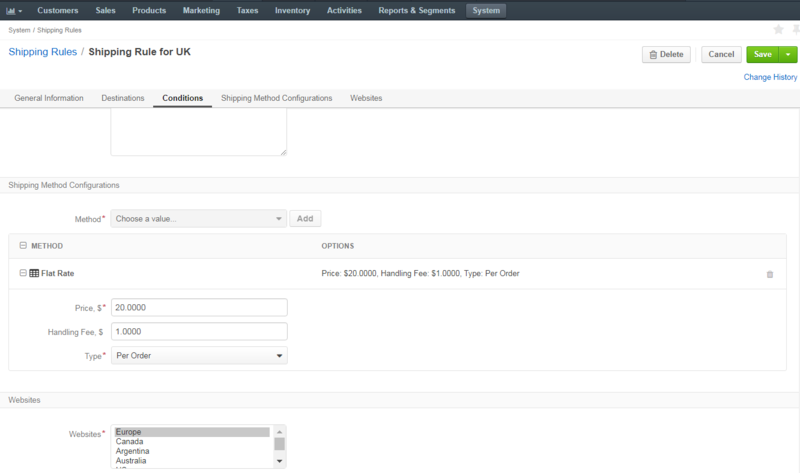 Configure all selected shipping methods. Configuration options vary depending on a shipping method. For details on options available for different methods, see Configure a Shipping Method in a Shipping Rule. The configuration summary appears next to the shipping method name, in the Options column. If a shipping method appears collapsed, click the Expand icon in front of its name to see the configuration options. In the Websites section, specify the website(s) that the shipping rule should apply to, if you have more than one website. This field is optional and may be left empty. Hold the Ctrl key to choose several websites, if necessary. Please note that application of shipping rules to websites is only available for Enterprise customers. When no website is selected, the shipping rule is always applied by default. When at least one website is selected, the shipping rule will apply to the orders created in the storefront of the specified website. After you have added a shipping method to the shipping rule, you are prompted to provide the information that configures the shipping fee components and the method to calculate it. Price—A shipping price based on your agreement with the shipping service provider. The final shipping price depends on the Type option (Pre Item/Per Order). Handling fee—An additional cost for order processing charged by your company. In the Surcharge field on top, enter a value that you want to be added to the standard UPS rates and the option surcharge (like the handling fee per order). Surcharge—To customize the shipping cost, enter a value to charge on top of the UPS standard rates (like the extra cost for this shipping method). It is applied together with the global shipping method surcharge. Select the Active check box in the Status column to enable the option. In the Surcharge field on top, enter a value that you want to be added to the standard FedEx rates and the option surcharge (like the handling fee per order). Surcharge — To customize the shipping cost, enter a value to charge on top of the FedEx standard rates (like the extra cost for this shipping method). It is applied together with the global shipping method surcharge. Handle Fee—An additional cost for order processing (packing and mailing, etc) charged by your company. It is applied as a surcharge to the flat fee specified in the used DPD integration. In the main menu, navigate to System > Shipping Rules. Choose the required shipping rule in the list, click the More Options menu at the end of the corresponding row. Select the checkboxes on the left of the corresponding rows. The selected shipping rules will be highlighted in yellow.